" This is my entry for the Christmas Giveaway hosted by Swee San of The Sweet Spot "
Miss M lives alone and she seldom eat meat and sinfully rich food like this for she is elderly and keeps to a simple and healthy diet . 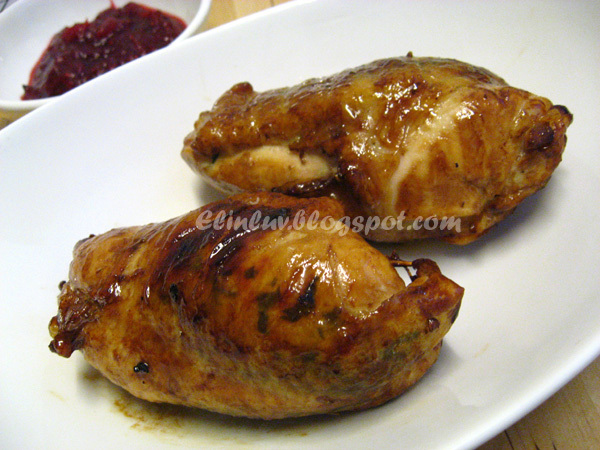 But I love to upset her healthy diet by cooking this delicious roast chicken for her. I just need to spice up her diet at times :p especially this Christmas season. She is a wonderful lady who has taught my Piggies lots of things in life. Sharing is one of the value she has taught them and she is very special to all of us. A great family friend and mentor to all of us. 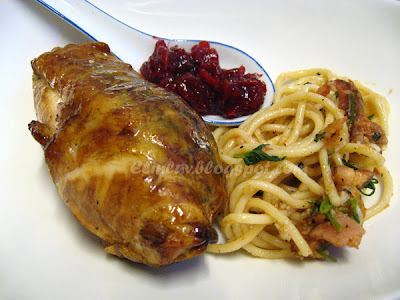 We love her and it was with great joy that I was able to make this special Roast Chicken Breast with ' turkey' stuffing and Aglio Olio Pasta for her. She loves them and I was happy that she enjoyed my cooking too....now I have another great taster to test out my cooking :) Of course Christmas is not the only time for sharing and giving. She has taught my Piggies to give and share to the less fortunate people all the year through and I truly appreciate her teachings..this post is dedicated to her . Back to this roast....I prepared the stuffing fit for a turkey and stuffed them into the breast pocket, baste it with balsamic & red wine marinade and roast it till golden brown. 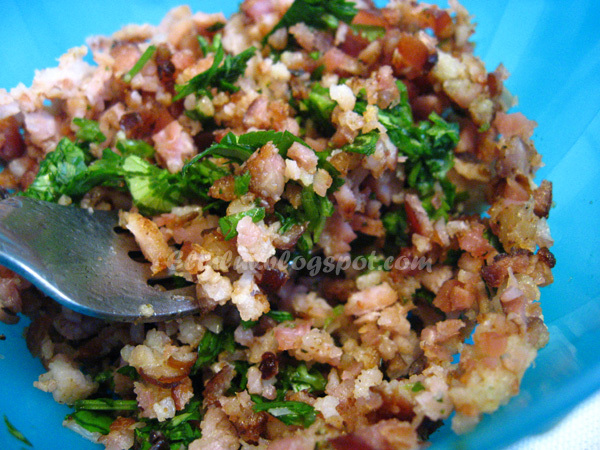 I applied a layer of cilantro garlic butter under the chicken skin to make it more flavorful and I will leave it to your imagination how aromatic this roast is with those delicious stuffing that is made of fresh cranberries, croutons, yellow onions , bacon chips and chopped cilantro.....every bite bursting with these flavorful stuffing fit for a turkey ! * Put all the cranberry sauce ingredients together in a saucepan and cook under medium low heat till the berries soften and and keep stirring till the sauce has thicken. 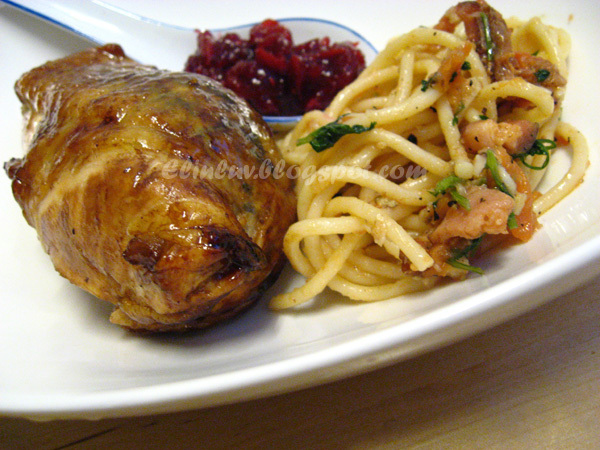 Dish out and serve with the roast chicken . Cut a slit on the breast meat without cutting through for stuffing. Stuff the chicken breast pocket with the sauteed ' turkey stuffing ' . 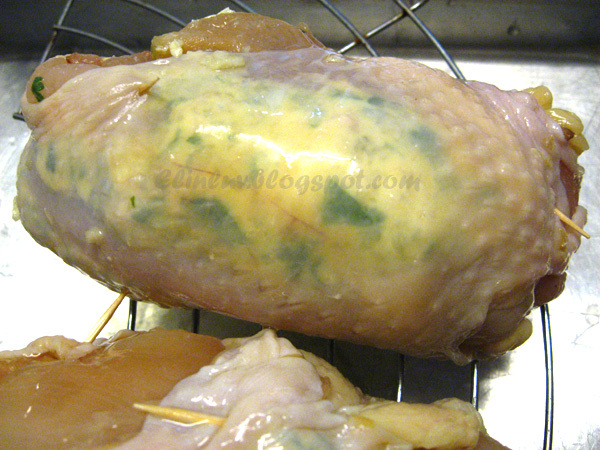 Apply a layer of cilantro garlic butter on the under side of the skin and wrap the skin around the breast meat and seal it with a bamboo skewer. 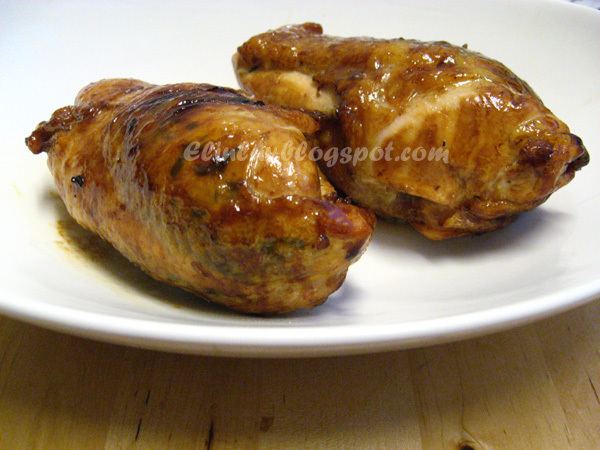 Place the stuffed chicken breasts on a rack with a baking pan below to collect the oil drippings. Roast the chicken breast in preheated oven at 200C for 35 minutes with basting of marinade sauce every 5 minutes until cooked and golden brown. Serve with cranberry sauce. Wow, Miss M does sound like a lovely person and you and your piggies are lucky to have her in your life! She is an amazing person. This dish looks over the top amazing - how could it not with all those ingredients. Yum! What a lovely meal! I'm sure every bite is delightful....yum. Merry Christmas and Happy New Year! What a lovely tribute to Miss M! And those chicken breasts! Oh. My. I thought I was over rich foods until the next holiday, but they look amazing! Look at all that bacon in the stuffing! It just looks fabulous. Another to-die-for dish!!! Yummmm!!! No photo showing the inside after cooking? Whatever, bet it tastes like heaven... Wish my missus would be more adventurous - not the same ol' recipes all the time. Delicious,how I wish I am your neighbour. Good for small family,unlike the huge turkey, we cannot finish. Sharing is happiness. Merry Christmas and a happy new year to you!!! Hi Elin...the other day Kathy (Smallkucing) went to visit Claire and brought back some fruit cakes...she said, it was from you and she shared it with me. It was delicious. Thank you for the fruitcake, Elin. I really enjoyed it and my boy loves it to bits. what an incredible meal! You really went all out with that lovely chicken breast, and I must say its perfectly done, beautiful and I can only imagine how delicious it was.....sigh. your aioli and the cranberry sauce just took this meal to another level! I see…this is how you stuff the chicken breast. Thanks for sharing. Sounds like an excellent holiday meal! Loving your turkey stuffing with bacon chips and cranberries! Happy New Year! That's a sumptuous X'mas meal. Mouth watering! Happy Holidays! 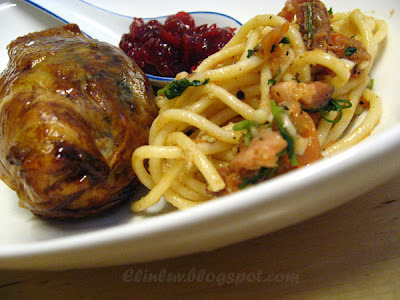 a very delicious meal i would say ..and also to go with the cranberry sauce, you're good lah, elin!